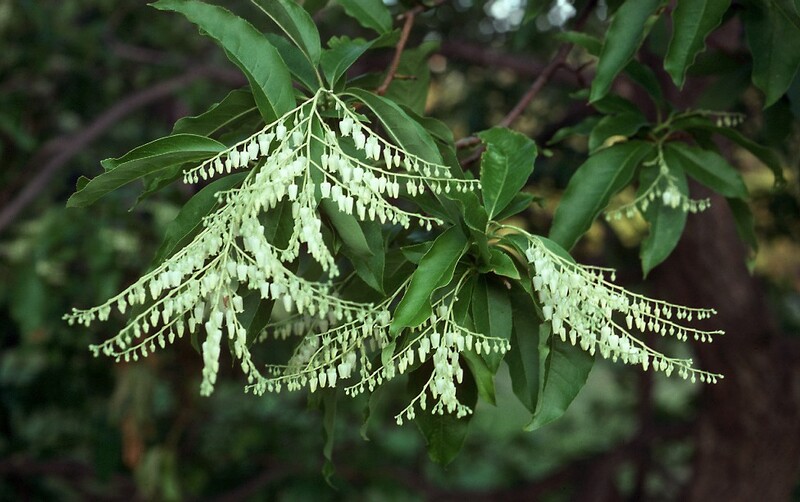 Oxydendrum is sister to the remaining Vaccinioideae and is distinctive because its terminal inflorescence produces fruits in the same year that the shoot is initiated (Lems, 1962). Oxydendrum possesses distinctive floral anatomy [all traces to the floral organs leave the elongated floral axis separately (Palser, 1952)] and the elongate-ovoid capsules are unique to the genus. Its leaves have paracytic stomata, which are of limited occurrence in Ericaceae, but may be found in most Gaultherieae. Finally, the basal placentae and stout, non-glandular, multicellular hairs are distinctive. The remaining genera of Vaccinioideae belong to one of four major clades: Lyonieae, Vaccinieae, Andromedeae, and Gaultherieae. Together, these four tribes may form a clade, which can be diagnosed by its inflorescences axillary at initiation (char. #29; Fig. 12), developing on shoots of the previous season (char. #30), and bearing flowers with articulated pedicels (char. #37; Fig. 26). Oxydendreae Cox, Am. Midl. Nat. 40: 505. 1948. – Type genus: Oxydendrum DC. Trees, deciduous, with non-ericoid, entire to serrulate or serrate leaves, convolute in bud. Leaf epidermal cells not lignified. Indumentum of stout, non-glandular hairs. Inflorescence terminal, produced on the shoots of the current season, paniculate, of few to numerous arching-declinate racemes or secondary panicles; bracts present, bracteoles paired, near midpoint to apex of pedicel; calyx not articulated with pedicel. Flowers 5-merous, actinomorphic, with distinctive anatomy. Calyx lobes small, persistent; corolla sympetalous, ± urceolate, the lobes small; stamens 10, the filaments straight, unicellular-pubescent, lacking spurs; anthers slightly roughened, with a white deposit of disintegration tissue dorsally, dehiscing by terminal, slit-like pores. Ovary 5-locular, with axile placentation, superior; style strongly impressed; stigma truncate. Fruit a loculicidal capsule; seeds with elongate testa cells; embryo with 2 cotyledons.